The ASX Series is a family of fully featured, single and three phase AC Power Sources. Available models range from 1.5kVA to 12kVA with either Manual or Programmable Control. Cost effective and fully programmable for both basic frequency conversion and advanced AC power line disturbance test applications. New: Inquire about our latest 315ASX-UPC3C and 320ASX-UPC3C value models. For questions regarding the ASX Series and or custom solutions, please contact us directly or try our live chat. The ASX Series is a family of High Performance Switching AC Power Sources covering the power range from 1.5kVA to 6kVA (1). The product line offers both single and three phase models. Units are conservatively designed and output power ratings are based on the most severe combination of input line, output voltage, power factor, and temperature. Note 1: For requirements higher than 6kVA, see ADF Series and AFX Series. All single phase output units (Model 115 ASX excepted) are operable with dual voltage ranges as listed. Three phase units are operable as single phase with dual voltage range capability or as three phase. Output voltage ranges and 1ø/3ø conversions are selected by front panel or bus commands. Output voltage ranges listed are for standard units. VMAX is output voltage with nominal input and full rated load applied. Other voltage ranges are available with the output magnetics options. Single phase input: 100, 110, 120, 208, 220 and 240 VAC ±10%. Three phase input: 208,220,240,380,416 and 480 VAC ± 10%. (480 V input and 400 Hz input are each available as a cost option.) *Single phase version available for added cost. All ASX Series power source models may be equipped with a digitally programmable Oscillator/Controller or a manual version. Models 315ASX-UPC3C and 320ASX-UPC3C include HAS, Prog-Z and Inrush Current Measurement features. Single phase power source models may be controlled to operate on either a 0-135 VAC range or a 0-270 VAC range. Three phase models are additionally switchable 3ø to 1ø output power form. Total control of the output power form and the selection of either the direct output or the optional transformer output is available from the front panel or the bus. All operating functions may be controlled from either the front panel or from a remote RS-232 or IEEE 488.2/ SCPI BUS. LabVIEW for Windows® and LabWindows® Instrument Drivers are available. Provides for exceptional accuracy of the AC output Voltage. When enabled, accuracy improves to ±0.1% referenced to the power source internal voltmeter. Programmable Output Impedance provides the operator with the ability to dynamically control the output impedance of the AC Power Source. Using the output current term as conditioned feedback signal to the output voltage circuits, positive or negative impedance may be programmed. This control simulates the effects of, or compensates for high peak current, distribution, or transformer losses of up to ±10% of the output voltage. This feature creates positive, negative, or zero output impedance (Zo). Compensates for line distribution or transformer losses. Simulates a soft power line for product testing. Compensation range is ±10% of the output voltage. Up to 22 different waveforms can be stored in the waveform library for execution as part of a steady state program or for substitution in any output phase as part of a transient test program. Memory location #1 is a non-editable high resolution sine wave. Locations 2-22 are editable and can be substituted in any output phase. An unlimited number of waveforms may be stored on the computer for those using a programmable UPC. A full-featured editor permits modification of a stored waveform in both time and frequency domains. This method can be used to quickly create spikes, dropouts, notches and other sub-cycle wave conditions. The resulting modified waveform is stored for execution in steady-state or transient programs. Provides both graphic (using LabView for Windows®) and numeric displays of the harmonic structure of a voltage or current waveform. Each waveform is analyzed for its harmonic content up to the 51st harmonic. Amplitude and phase are reported to the local display. The LabVIEWT instrument driver displays numeric values as well as a graphic summary of the harmonic spectrum. Quickly create virtually any AC test waveform by building it out of harmonics. The process is as simple as keying in the magnitude and phase angle of each desired harmonic up through the 51st. Additionally, waveforms can be created by downloading from a host PC. The ASX Series Power Source is equipped with a powerful microcontroller to create a fully integrated test system. It supplies a variety of power conditions to the device under test and meters/analyzes all output performance parameters. Six controller models are available with the ASX-Series. They include 1 Phase and 3 Phase models for both manual and programmable control. UPC-1M, 1 Phase Manual Control, 15 Hz to 1,200 Hz. UPC-3M, 3 Phase Manual Control, 15 Hz to 1,200 Hz. UPC-3EM, Export Version: 3 Phase Manual Control, 15 Hz to 1,200 Hz, reduced resolution. UPC-1, 1 Phase Programmable Control, 15 Hz to 1,200 Hz. UPC-3, 3 Phase Programmable Control, 15 Hz to 1,200 Hz. UPC-3E, Export Version: 3 Phase Programmable Control, 15 Hz to 1,200 Hz, reduced resolution. All controllers provide manual operation from the front panel. Programmable Controllers may be programmed from the front panel or from a remote interface. RS232 Interface is standard. IEEE 488 interface is optional. 0.1% max for a ±10% line change. 0.25% 15 to 400 Hz., 0.50% 400 to 1,200 Hz. With external sense enabled. Improves to less than 0.1% with external sense and CSC enabled. 0.25% THD 15 to 200 Hz., 0.50% THD 200 to 1,200 Hz. 60 microseconds typical, 10-90% load step. All models are designed for operation in 19 inch equipment racks. Models 4 kVA and higher have side handles for ease of handling. Standard 19 inch rack. Slide rails are available as an option for all models. See models table tab for panel height. Approximately 24 inch, from the front panel to the rear of the chassis. Front or side forced air intake with rear exhaust. Automatic Fan Speed Control for low acoustic noise and extended fan life. ASX Series Power Sources can be equipped with output transformers to provide an alternate output voltage range. Selection of direct or transformer coupled range is performed by the controller via front panel or bus command. The standard frequency range for transformer coupled outputs is 45 to 1,200 Hz. Standard output ratios are 1.5:1, 2.0:1, and 2.5:1. Transformer outputs are supplied internally or externally via a Magnetics Module as listed in the above table. Consult the factory for additional information regarding special output ranges not listed above. The latest additions to Pacific’s SmartsourceT family of UPC Controllers are the UPC-1M, UPC-3M, UPC-1 and UPC-3. The UPC Controller is a modular component of the ASX Series and is available in four configurations ranging from 1 Phase to 3 Phase and Manual Control to Programmable Control. The table below lists each model according to key features. All UPC Controllers include precise metering functions with data displayed via a 160 character LCD display. This, along with the 30-key front panel, provides the industry’s most powerful and user-friendly controller. The UPC-1 and UPC-3 controllers are available with either the RS-232 or GPIB remote interface. Commands are structured in accordance with SCPI (Standard Commands for Programmable Instruments). The RS-232 serial port operates up to 38.4 Bps. The GPIB interface is compatible with the IEEE-488.2. Range: 15 to 1,200 Hz. Resolution: 4 significant digits, eg. 50.00, 400.0, etc. Range: 0 to Vmax in 0.1 VAC steps. Accuracy: Executive voltage is within ±50 mVAC (0.05%) of command voltage referenced to the internal voltmeter with CSC engaged. Phase Separation of Phases B and C are programmable 0 to 360° relative to phase A on the UPC-3 controller. Phase separation is fixed at 120° and 240°, respectively, on the UPC-3M controller. Programmable Current limit is provided on the UPC-1 and the UPC-3 controllers. Programmable range is from 0 to Ipeak, max of the power source. The Output Voltmeter is true RMS reading and each phase is measured independently. Line to neutral and line to line voltages are displayed. Range: 0-354 VACL-N, 0-708 VACL-L. Resolution: 0.1 VAC to front panel, 0.001 VAC to remote interface. Accuracy: ±0.2% of range + cal. ref. 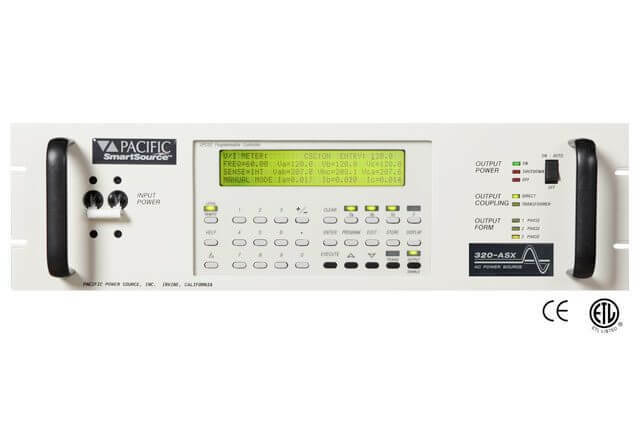 Output Ammeter is true RMS reading and each phase is measured independently. RMS and peak currents along with Crest factor are displayed. Range: 300% of system current rating. Resolution: 0.01 AAC to front panel, 0.001 AAC to remote interface. Accuracy: ±0.2% of range + cal ref. Measures True Power (kW), Apparent Power (kVA) and power factor. Range: Based on ammeter. Resolution: 1.0 watts or VA to front panel, 1.0 watts or VA to remote interface. Calculated and displayed to three significant digits. Pacific’s line of Smartsource® AC Power Sources enable the engineer to easily automate his testing by using Lab VIEW for Windows® or LabWindows®. 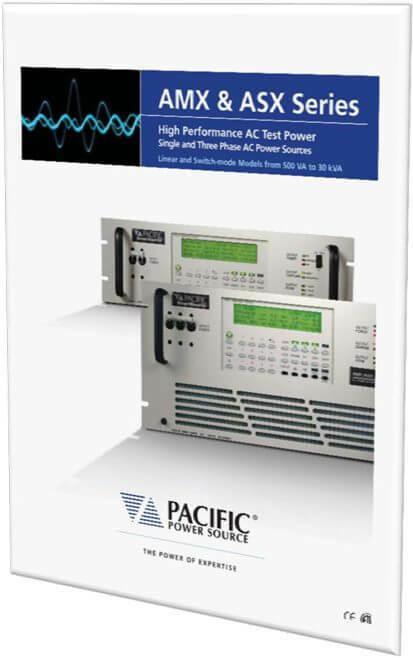 An extensive list of Virtual Instruments (VIs) are offered for Pacific’s ASX Series Power Sources. Download brochure to review product and application notes. Pacific Power Source’s seasoned sales and service team is here to help via chat, email or call 1-800-854-2433 or +1-949-251-1800.